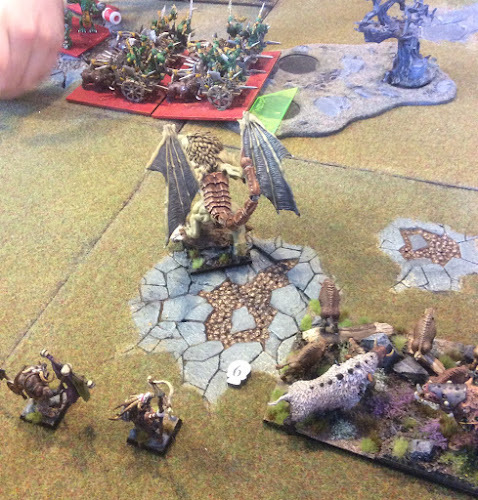 In the centre he had three mounted Godspeakers, two Orcling Hordes and a Giant. On my extreme left he then had a Greatax Regiment. 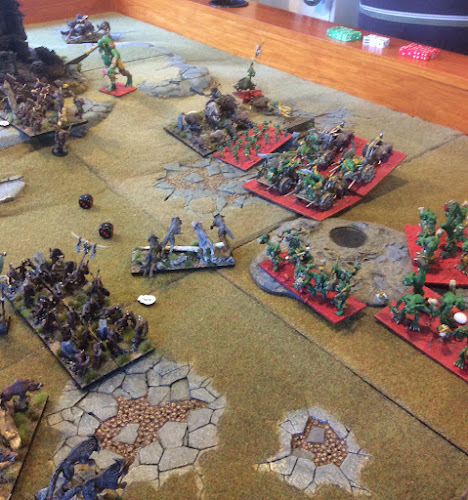 You can see my left here with a Horde of Lycans and a Troop of Harpies. My plan is to secure the two sectors on the left. 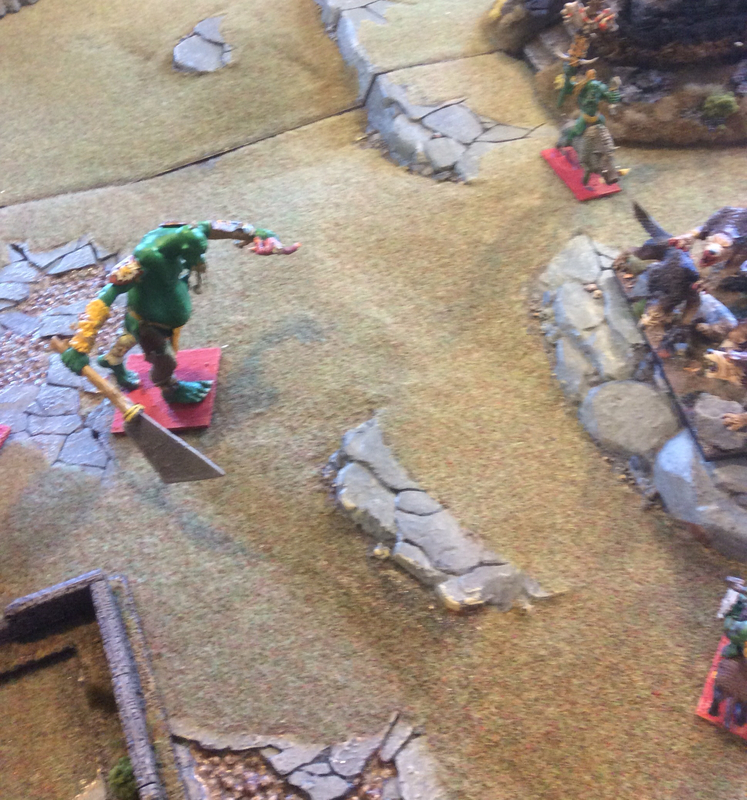 Rob vanguarded his Skulks forward. 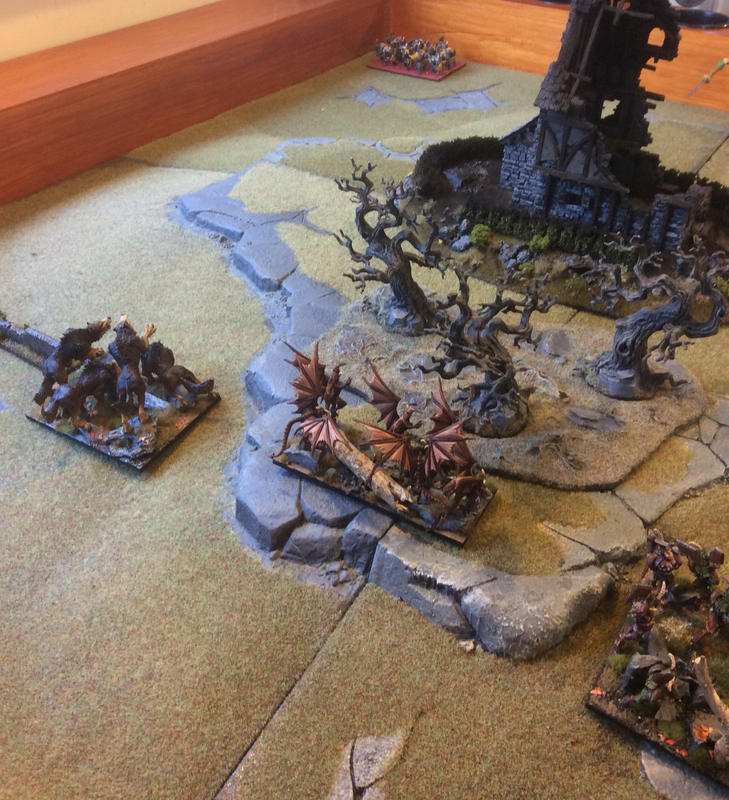 I won the roll for First Turn and took it. 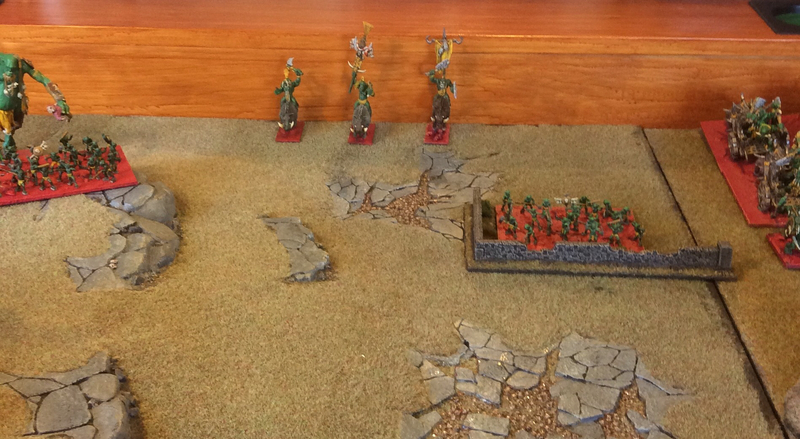 I advanced my line tentatively ready for some chaff shenanigans in the Second Turn. 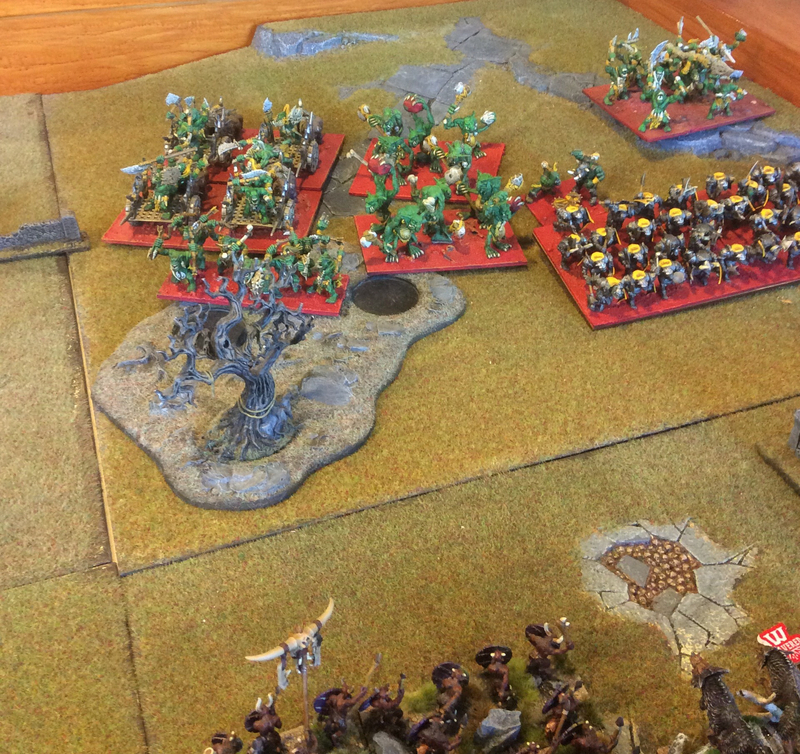 Unfortunately for me Rob's Skulks Wavered my leading Beast Pack. In the centre I came forward looking to hit the units hard and fast turning the battlefield around, hemming Rob in on my right. On the left I had a numerical advantage but made my first error of the day. 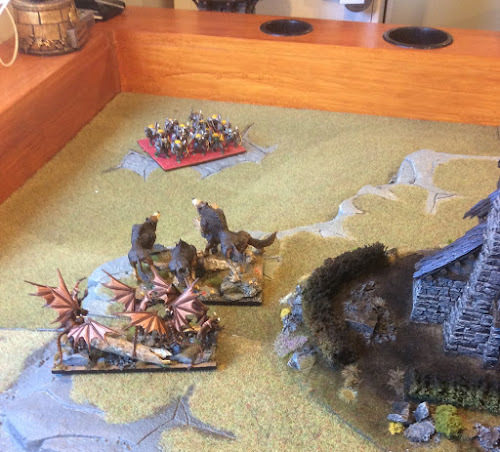 In an example of poor placement I had positioned my Harpies so that when Rob advanced I couldn't see the Greatax over my Lycans. This meant I had a single unit rather than combined charge. 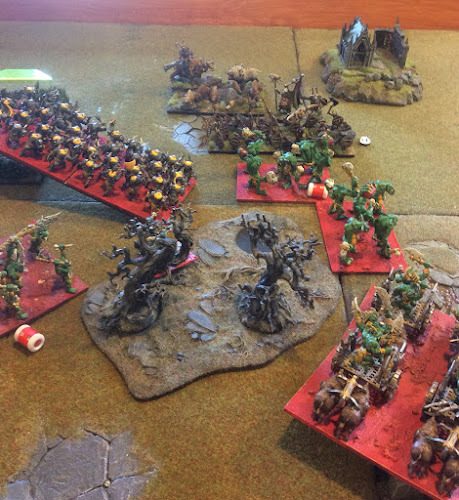 The Longhorns and Stampede removed the Orcling Horde while the Beast Pack charged the second Orcling. In retrospect I believe I would have been better served only charging the left unit with Longhorns + Beast Pack. 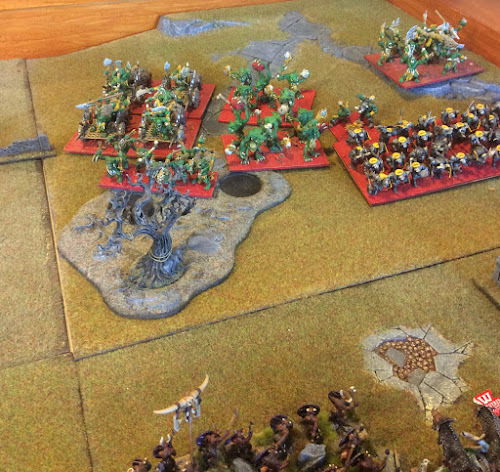 If I'd lost a Beast Pack to a subsequent flank charge it wouldn't have been too much of an issue. The Lycans hit the Greatax and bounced. 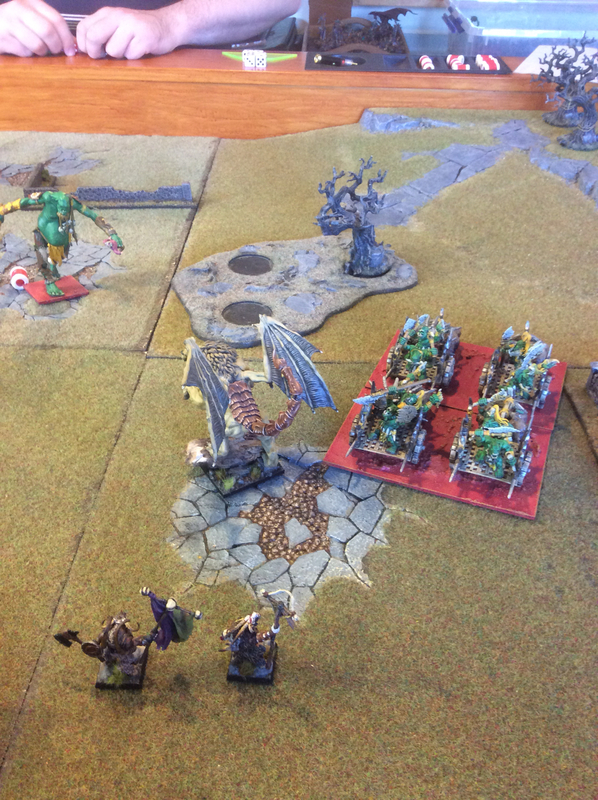 It is likely that with the Harpies involved I would have broken then in that single turn. Lesson learned. As a result I would be held up for an additional turn. The Harpies can only look on in shame. 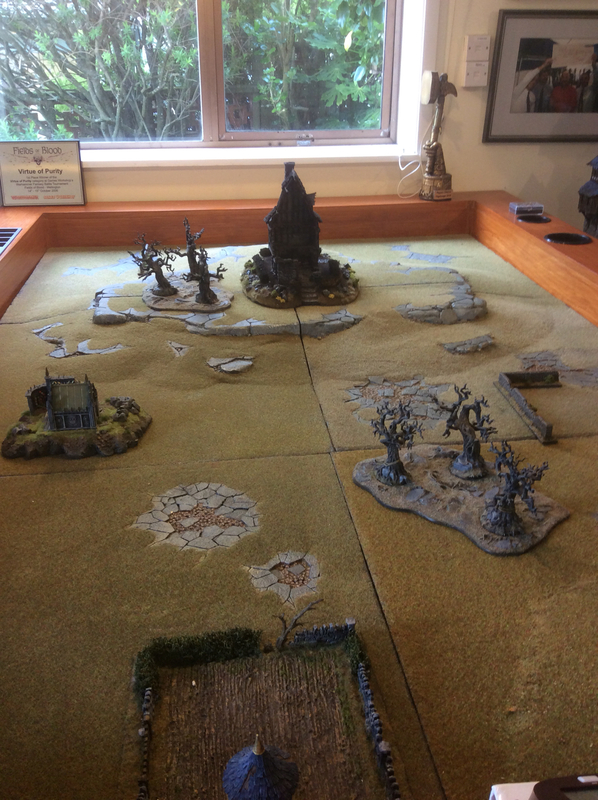 The standoff on the right continues with Rob edging forward. Here you get a better view of Rob's advance. 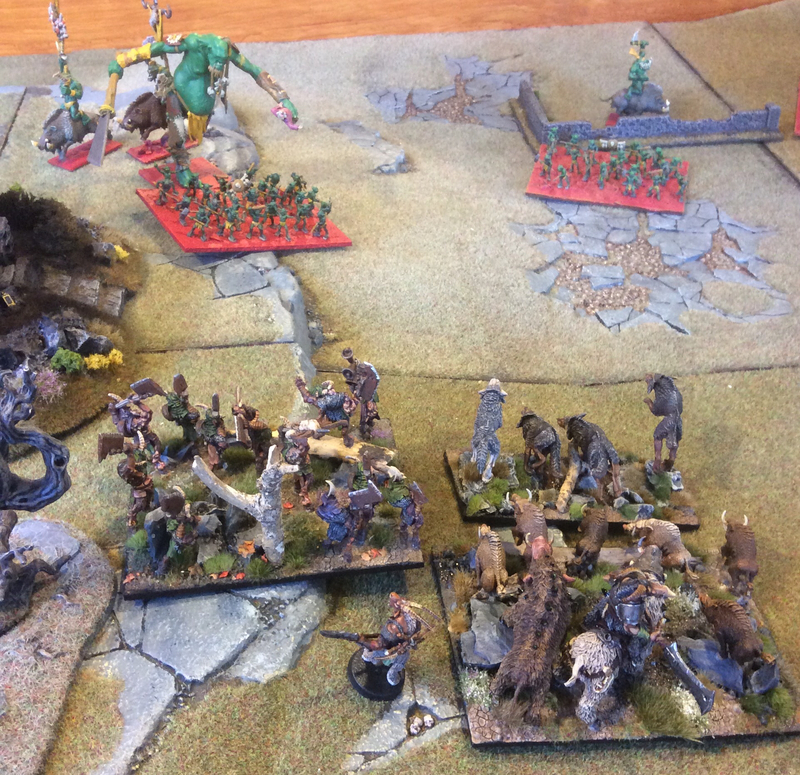 The Giant has countercharged the Longhorns, the Orclings and Fight Wagons are about to destroy the centre Beast Pack. A closer view of the centre action. 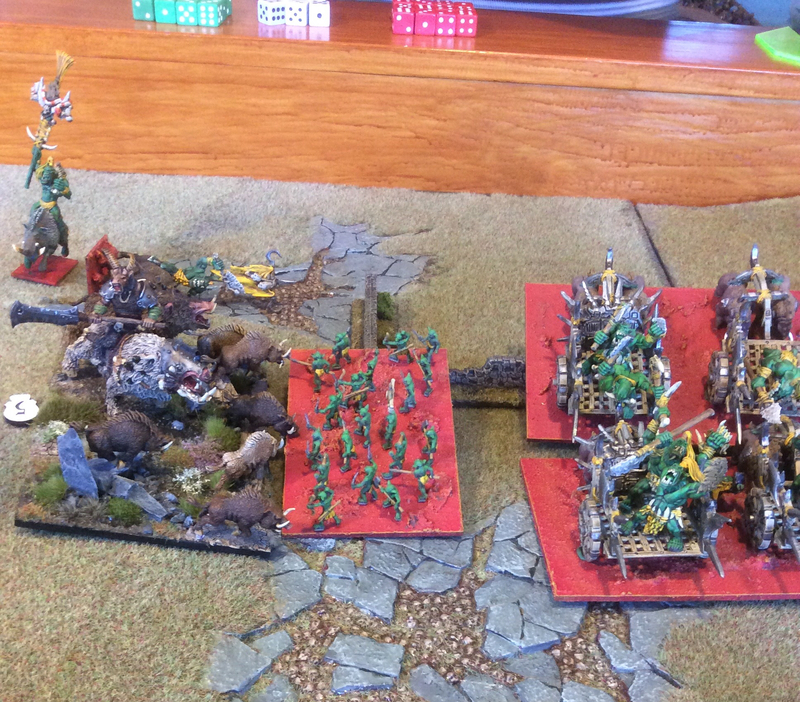 Rob will destroy the Beasts and reform the Orclings to face my left and Fight Wagons reform facing up table. These next photos show the decisions I had to make in the centre. I was able to charge a Godspeaker and then overrun into the Orclings. This would expose the flank of the Fight Wagons to my Stampede. 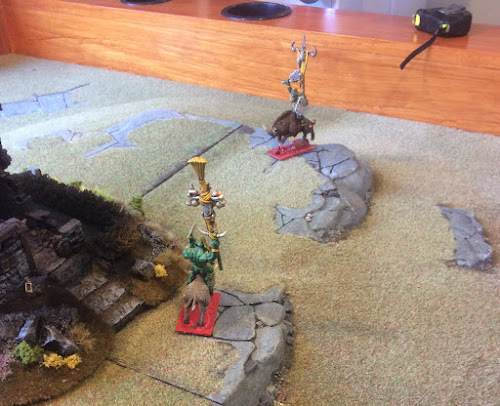 To do this I had to forego the countercharge of the Longhorns on the Giant. 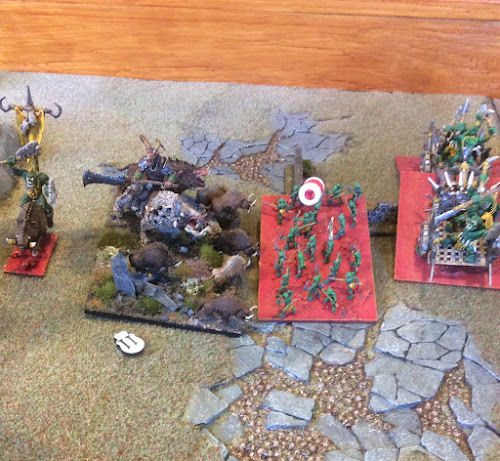 I decided to do this....blew through the Godspeaker and did 18 wounds on the Orclings. Unfortunately I then decided to roll "Snake Eyes". This held up the Stampede for another turn meaning that the Fight Wagons escaped my threat. 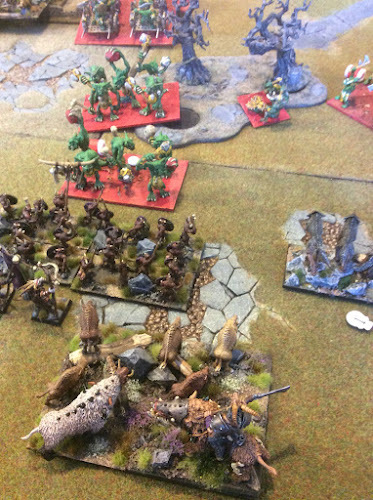 It also exposed the Longhorns to another charge. 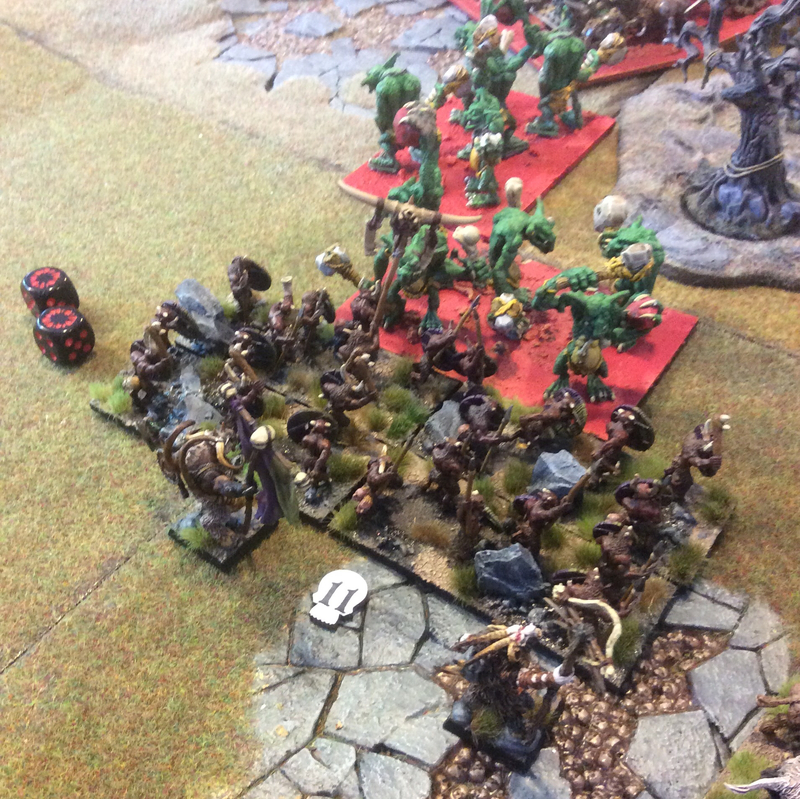 The Stampede are singularly unimpressed to about the Orcling countercharge. 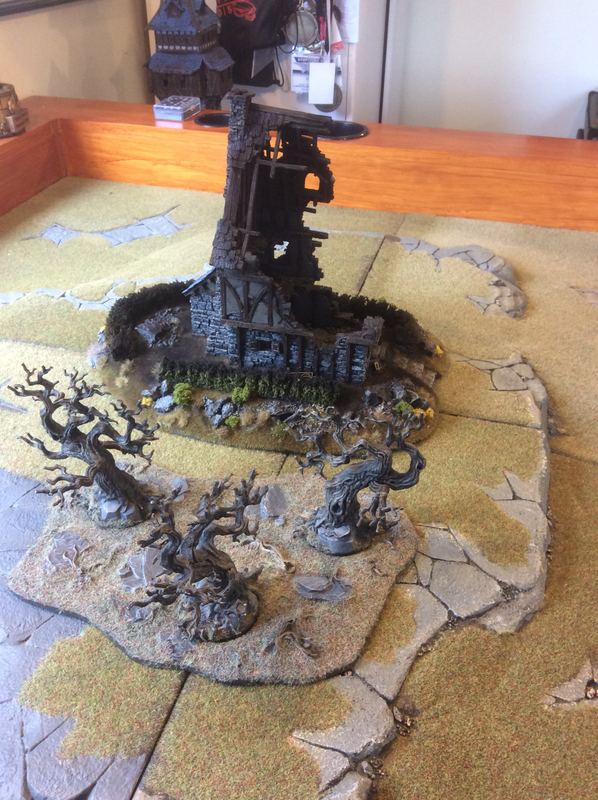 Especially when they take six more wounds. 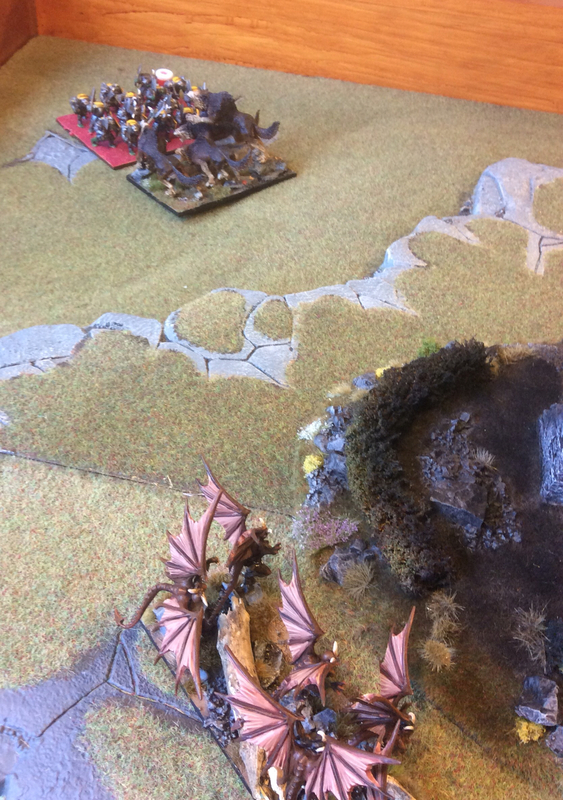 On the right, the Chimera has flown onto the flank of the Morax and manages to waver them after the intervention of the War Drums. The Beasts are king what Beasts do. 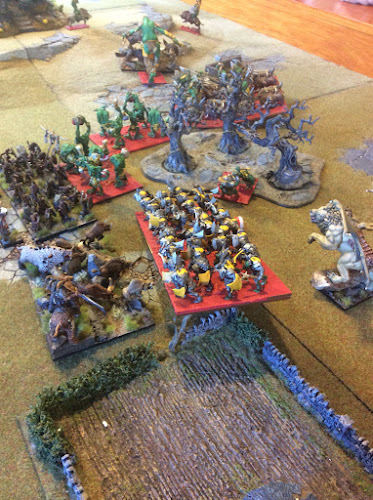 The Spiritwalkers are about to be charged by the Trolls while the Stampede lurks with intent. The two Godspeakers remove the Shaman with Fireball which assists the Giant in finishing the Longhorns. The Giant is now facing its baseline ready to charge the Stampede after it belatedly finishes off the Orclings. 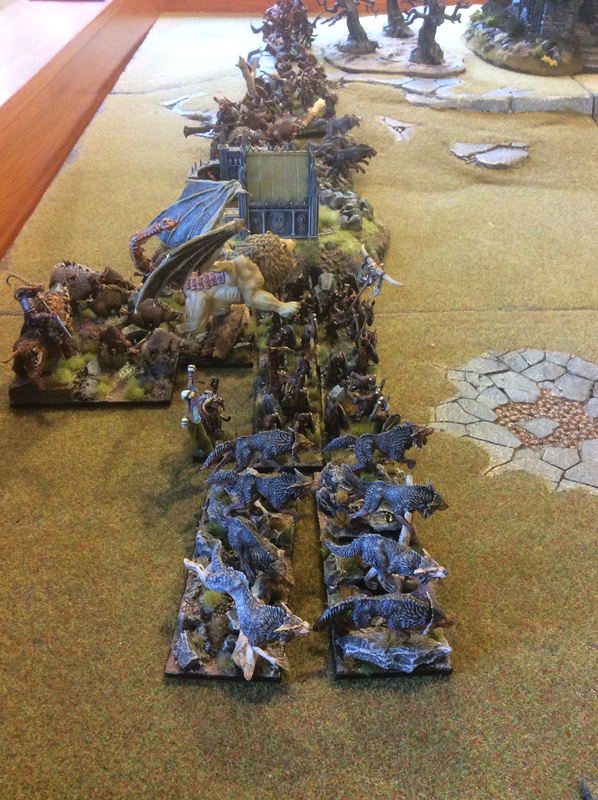 In goes the Giant destroying the Stampede and reforming to face the Lycans. The view from the IRC lines. The Ax Horde has routed the Beasts while the Trolls have charged the Spiritwalkers. 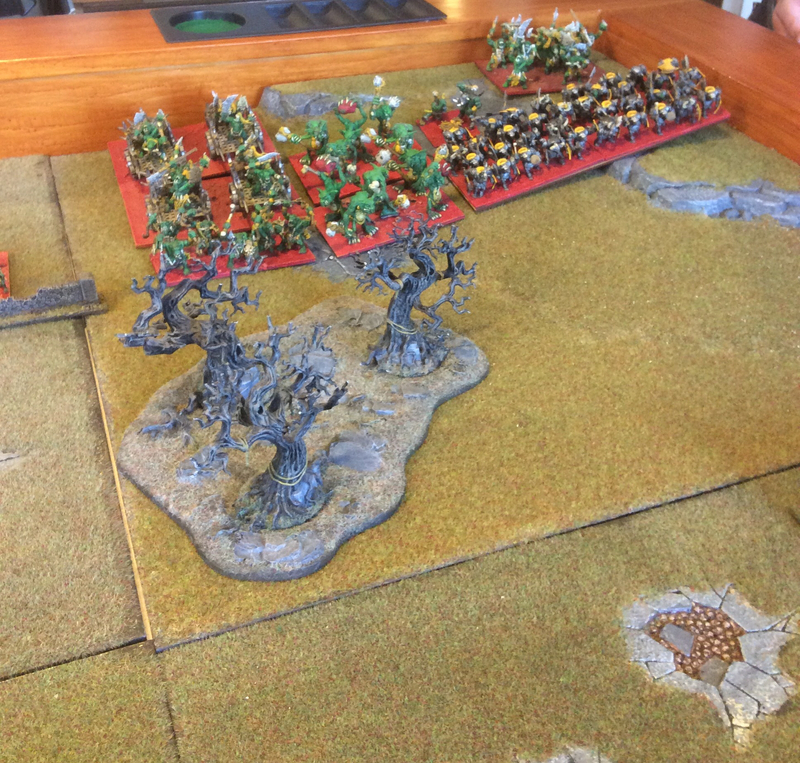 The second Troll unit make a decisive move towards the centre. In charges the Stampede doing 18 wounds to the Ax Horde. Because of the War Drums it has a single roll of 4/6 but rolls a "3". Behind the Ax the Mor Ax are about to fall to the Chimera. The Spiritwalkers need a "9" to break the Trolls which they get. 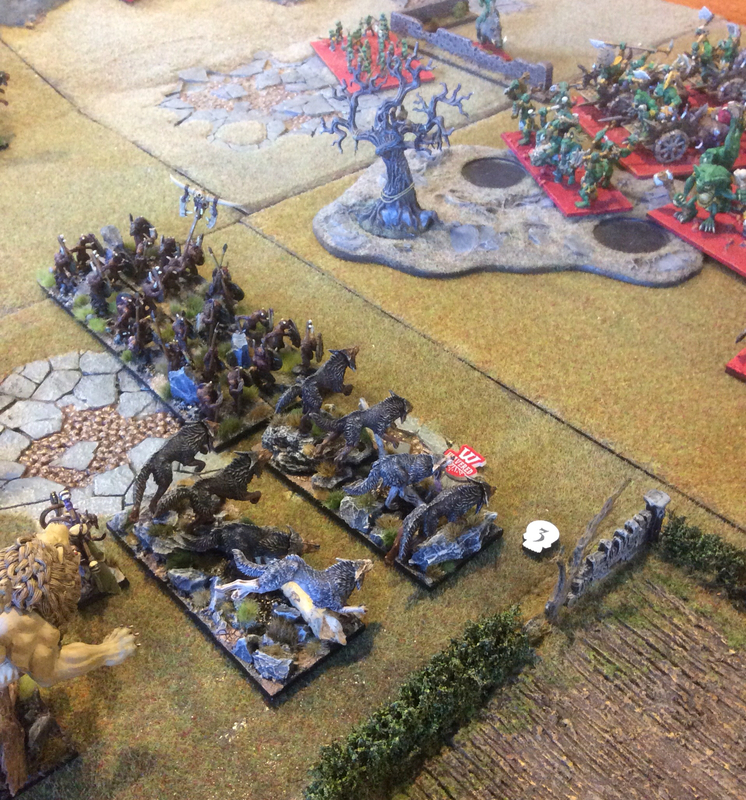 The second Troll unit charges the Lycans with the Giant. They need "9" to break it which they get. 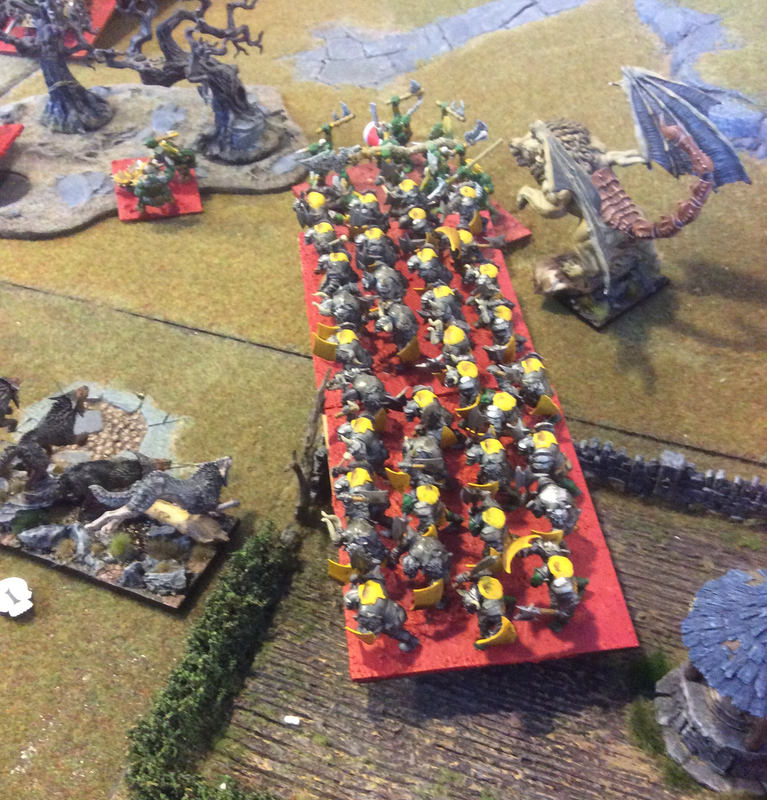 Their move allows the Fight Wagons to charge the Spiritwalkers breaking them. They reform towards the triumphant Chimera. 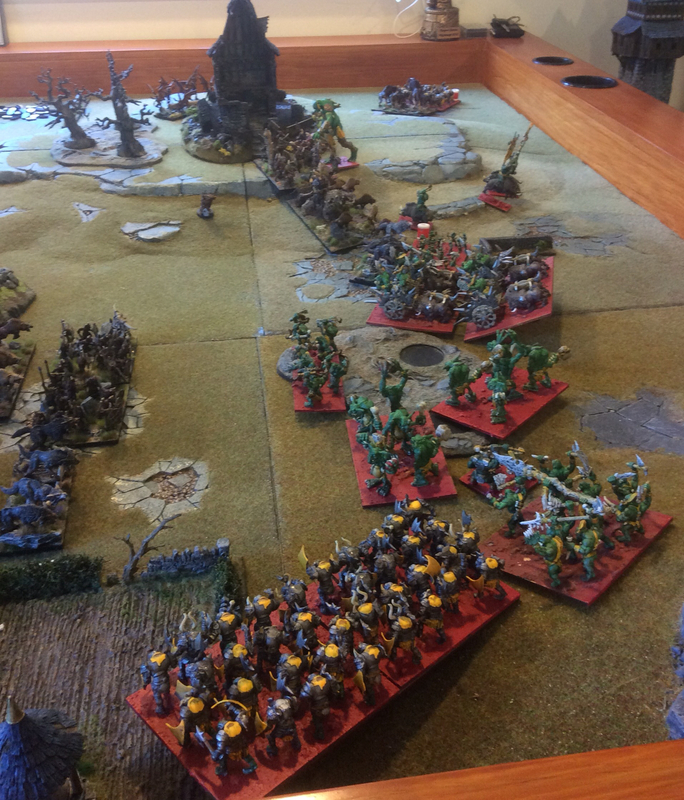 Here I make the mistake of charging the War Drums. I break it but I would have been better parking it in front of the Fight Wagons. The Stampede removes the Ax Horde but it is now half an inch in the Fight Wagons charge reach. I should have sacrificed the Chimera setting up a Stampede charge on the Fight Wagons. 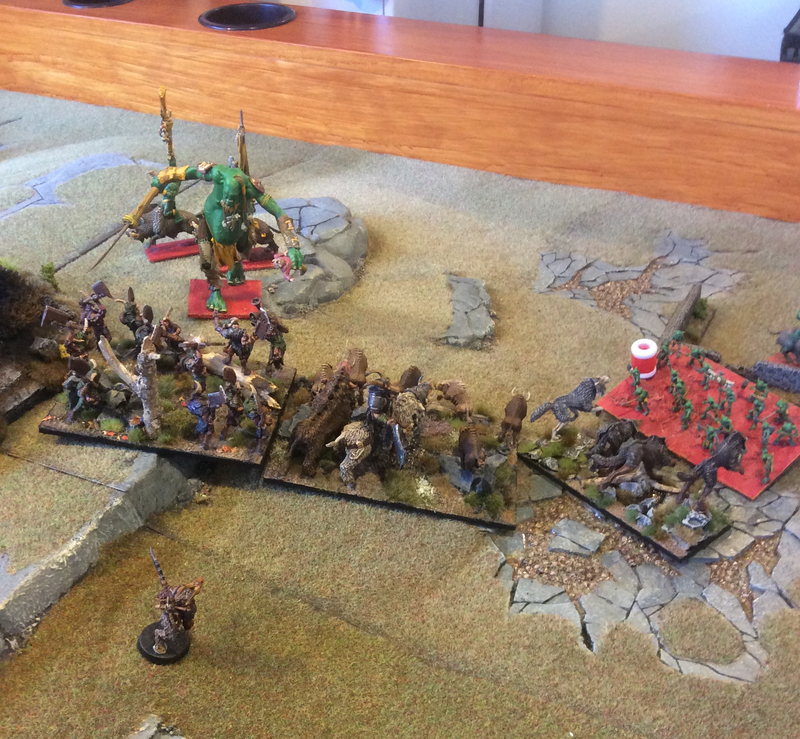 Things are getting desperate and so I fly the Harpies into the centre to contest and stop the Giant leaving. They just need to survive 18 Fireballs. They don't. 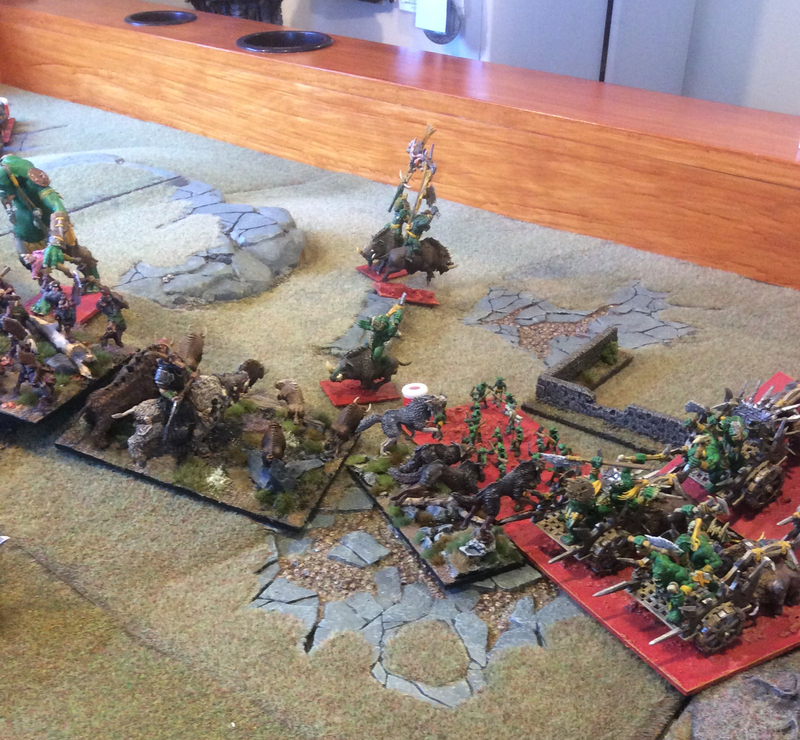 Again in retrospect this was not necessarily the best move as a Turn 7 would have seen them destroyed certainly. The Fight Wagons break the Stampede giving Rob that sector. 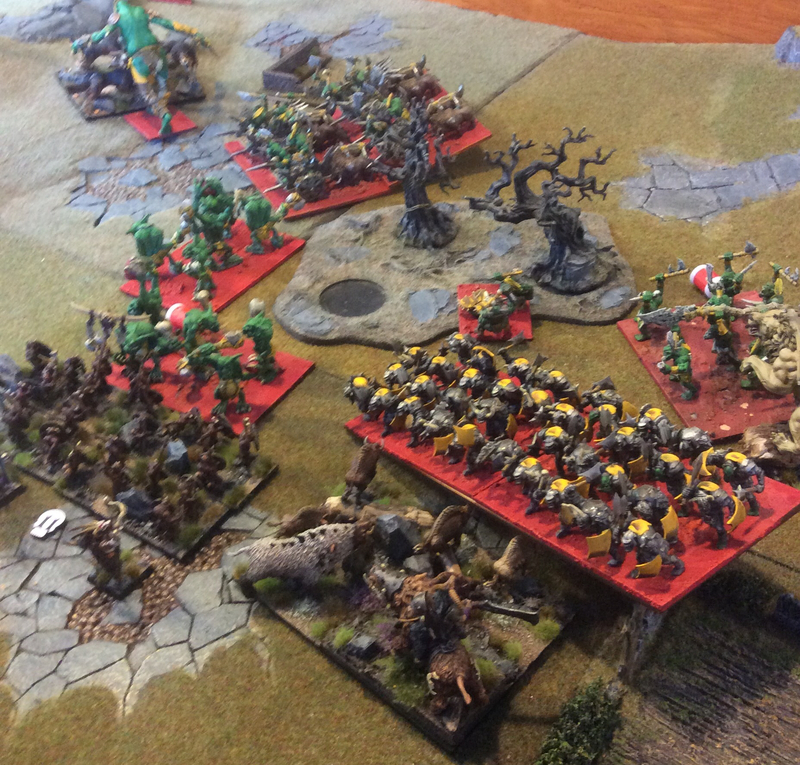 The surviving Trolls can move into my centre giving Rob another two sectors while the best I can have is one. This was an excellent game. 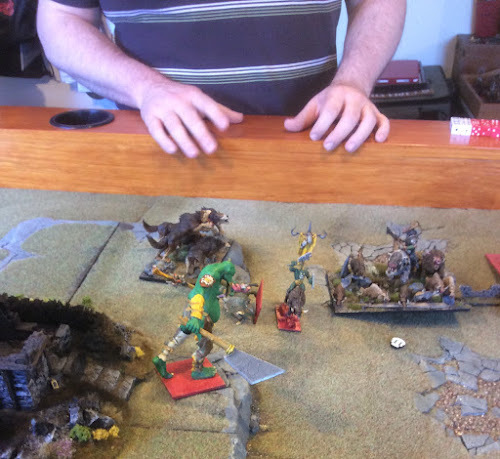 I both my loss down to some bad choices, bad positioning and Rob's play. 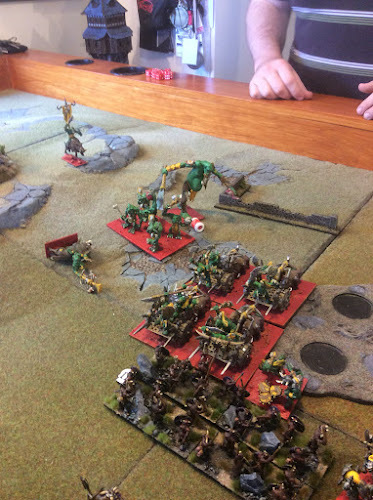 The Orclings holding against the Stampede really hurt me and shifted the battle in Rob's favour but I had opportunities to pull it back and in the heat of battle fell short. Well done to Rob, I'll get you next time!